I was more impressed by this game than any other match 3 game I have ever played! It had fun levels that became increasingly more difficult. 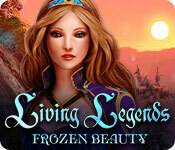 Awesome graphics and story line with Greek Mythology. Many of the higher levels had hidden tiles, jewels and tasks, making it mysterious but challenging to finish! 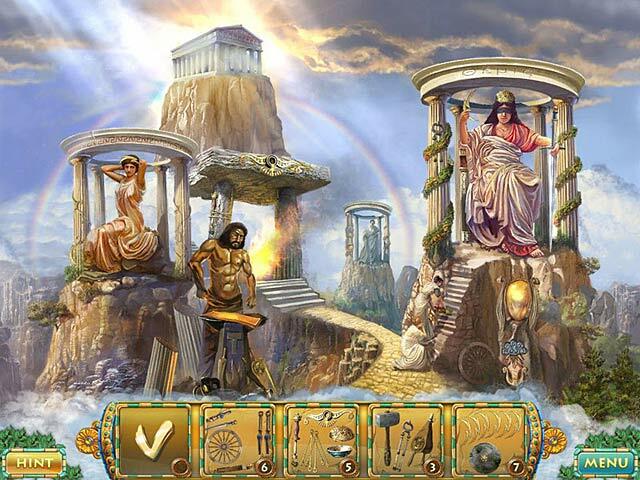 I loved the minigame hidden object puzzles and using the gods and heroes to help complete levels. The rewards you received throughout motivated me to finish the game. Challenging, but intriguing! I loved this game. It's funny to see all the actions of the rock falling. Try it, you will like it. Quite fun, very addictive plot. Good number of trophies to achieve to keep diversity. I really enjoyed this game. I have the others in the series but enjoyed this one the most. Each level is a bit more challenging when you play in "timed" mode. The extra games to build your castle once done require some thinking. All in all, a great game. Great addtion to the "Hellas" series. Most of the other reviewer have made excellent points about this wonderful game but I thought I'd add a couple different reasons that I love it a bit more than HoH2 1) I LOVE the fact that there is a "relaxed" option! I like to take my time and work out the best match and this game allows me to do that stress-free! 2) I LOVE that your game isn't interrupted by the awards. You are given any won awards at the END of each board. In HoH2, it drove me CRAZY when I was just setting up a great match and the stupid "award" screen would come on. I'd forget what I was doing in the game! 3) I really like that I have a choice of buildings. In HoH2, you just built. I'm a fan of the "blue roofs" myself! :D Great game! Thanks developers for listening to your fans! This is a excellent match3 game if you like games that you need to rebuild a town help the Heroes of Olympus.This is a must play match3 game and it's fun for the whole family. I am in awe of this game, probably the best M3 I have played. The graphics are beautiful, the game is very long and there is plenty of variety. Build a city by earning money in the M3 levels, save the city from various destructive events and gain the help of heroes through mini-games. You can even interact with the characters as your city grows. At the end of the game bonus levels are unlocked for building a castle. Some of these bonus levels contain unique and quite crafty puzzles. There is a timed mode and untimed mode. I would say this would be a hard game in timed mode. Have all 3 Heroes games & love them all. All offer re-play value - can keep playing over & over & never get bored. Very addictive game. I keep thinking I'll just finish the current level & then go to bed, but then I start another level & keep going. Heaps of levels on offer & they get harder & harder as you go. It is timed, which I know some don't like, but I like the challenge of trying to complete the task within the time limit. More than just a Match 3. Lots of fun. Enjoy playing games that are multifaceted. A nice mixture of match 3 and some puzzle activities as well. 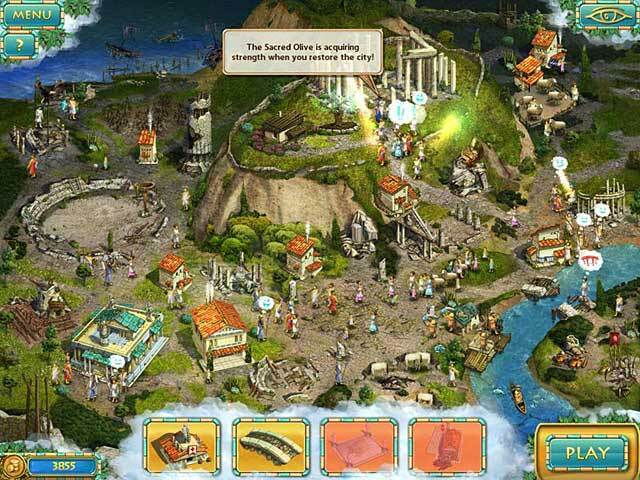 chain-to-match only Restore the city of Athens to its former glory after being destroyed by an unknown enemy of the goddess Athena. Earn gold by solving M3 levels, use the gold to purchase buildings. 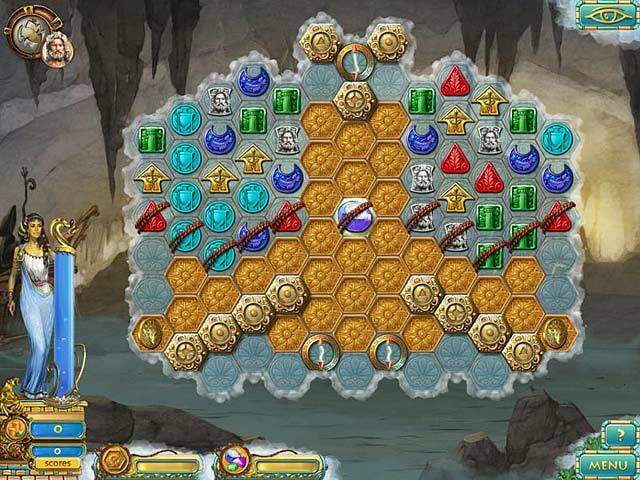 M3 levels have the usual helping tiles (lightning bolts, bombs etc), and obstacle tiles (rope, ice, unmovable metal blocks), and the goals vary from collect all the "gold" tiles, collect at certain amount of one colour tile, drop keys, gems, feathers to the bottom. 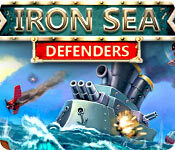 Earn trophies and achievements - this gives extra incentive and challenge. After finishing the city, you get "bonus" play - 15 levels normal (chain-to-match) levels, 15 levels of Puzzle - limited amount of moves so you must figure out the exact sequence of matching.